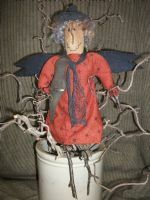 Belinda Witch, 20", is a fun piece for your Halloween decorating! She is featured in the 2010 Aug/Sept issue of Country Sampler Magazine. Belinda is made with osnaburg fabric and has a homespun fabric dress. She is holding a cloth crow and has Wool Felt wings. Her arms & legs are made with sticks from the back yard! 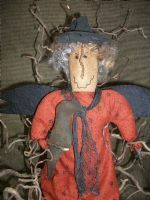 Cute little witch to hang in a wreath on the front door or prop her up aganist a grouping of gourds on the mantel. $34.50 FREE SHIPPING IN 48 U.S. Others email me for shipping costs.